Brighton is one of my favourite places to eat as there's such an amazing choice of restaurants, cafes and delis that are suitable for those following a more plant-based diet. 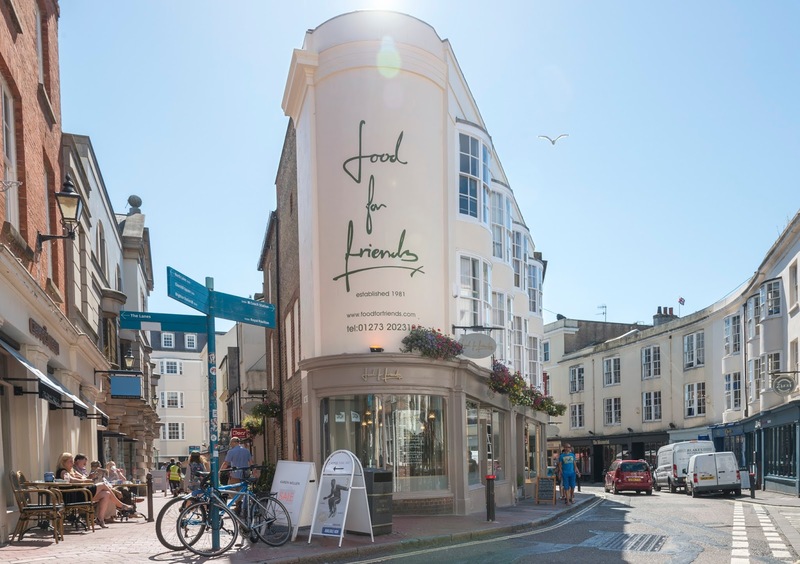 One of my favourite restaurants (not just in Brighton but ever) is Food For Friends, which is an award-winning vegetarian restaurant in the South Lanes. I first ate at Food For Friends a couple of years ago and have since been back a few times as I just can't get enough of their unbelievably flavoursome, fresh, delicious food! A couple of weeks ago I was invited along to Food For Friends to review some of their new dishes and I can honestly say it was one of the most wonderful meals I've ever had - from the service to the drinks and food, it was all outstanding. The only thing I could complain about is the baby crying on the table next to us for rather a long period of time, but hey...that's not the restaurants fault! Food For Friends is situated in the trendy South Lanes in an old but modernised space with elegant decor yet a laid-back, comfortable vibe. The space is quite small but by no-means claustrophobic thanks to the well-arranged tables and huge windows that let in lots of light and allow you to people watch as you eat. 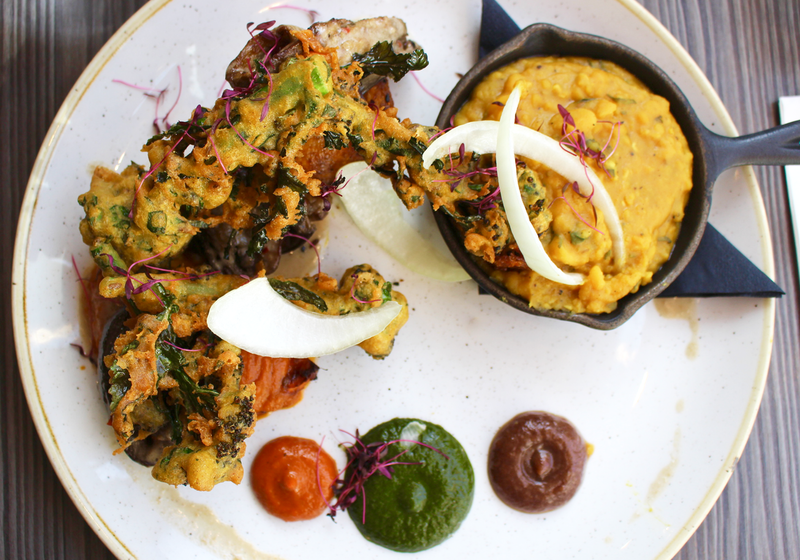 Food For Friends was founded with the ethos of serving global vegetarian cuisine that was not 'just a load of old lentils' but instead opening customers eyes to the fact vegetarian food can be just as (if not more) flavoursome as meat dishes. I am a vegetarian myself but my boyfriend who isn't agreed that you actually forget Food For Friends is a vegetarian restaurant...you don't look at the menu wondering where the meat is or feeling as if anything is missing from the dishes. I'm always a little wary about eating out because of having coeliac disease and needing to make sure there are both gluten free and vegetarian/dairy free options for me, but thankfully Food For Friend's menu has plenty of options for those with specific dietary requirements and the waiter was clued up on the seriousness of coeliac disease and made sure the kitchen knew to keep everything separate, which really impressed me and made me feel a lot more at ease. The fact there was so much delicious choice on the menu was fantastic but it did mean me and my boyfriend spent a solid half an hour deciding what to order! We started with drinks - I got the a non-alcoholic cocktail with fresh strawberries and lime which was simply delicious...I could have quite easily drank 10, and my boyfriend ordered a gluten free beer which he said was divine! 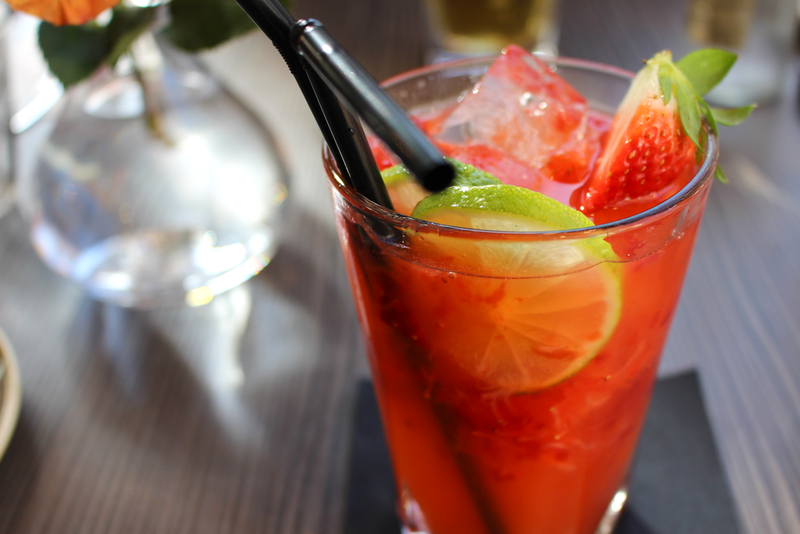 We sipped on our luxurious drinks as we browsed the menu, drooling over all the choices. Eventually we made a decision and ordered our meal! The starters menu is actually were I struggled the most. Every dish sounded out of this world and almost all of them are suitable (or can be adapted) for a gluten free/dairy free diet. I opted for the Satay Tempeh Skewers as I'd only ever eaten tempeh once before and wanted to see how the dish would come! 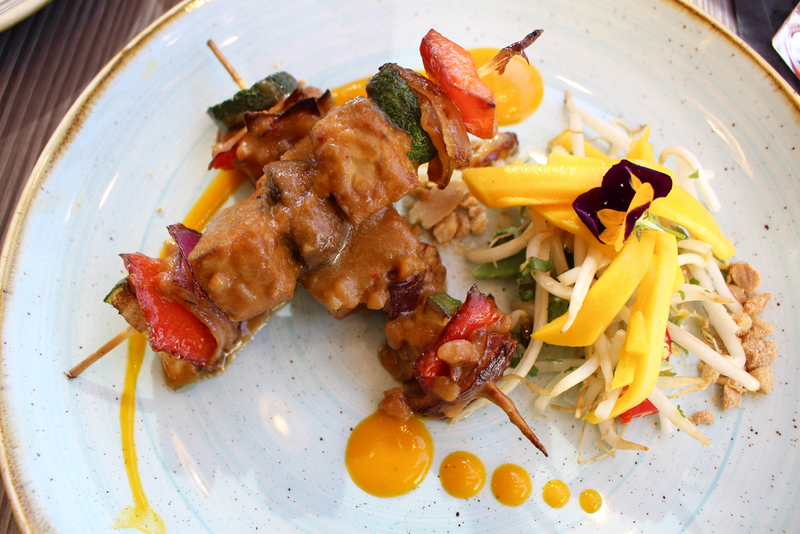 The tempeh skewers came served with a chilli, mango, bean sprout and herb salad and they had the most mouth-watering flavour to them. I don't know what the tempeh was coated and cooked in but it was so moreish, so flavoursome and so yummy! I was a little heartbroken when I came to the last bite. My boyfriend ordered the Five Spice Crispy Tofu and the Triple Cooked Chips - I tried the crispy tofu and can confirm it was cooked to perfection. The tofu was cooked with sesame and shoyu marinated aubergine and a cardamom, tomato and lemongrass relish - it was unlike another I've ever tasted, truly unique and truly special. The chips were demolished with approximately 30 seconds too, so I think that tells you how good they are! The scrumptiousness of the starters made us even more excited for our mains! 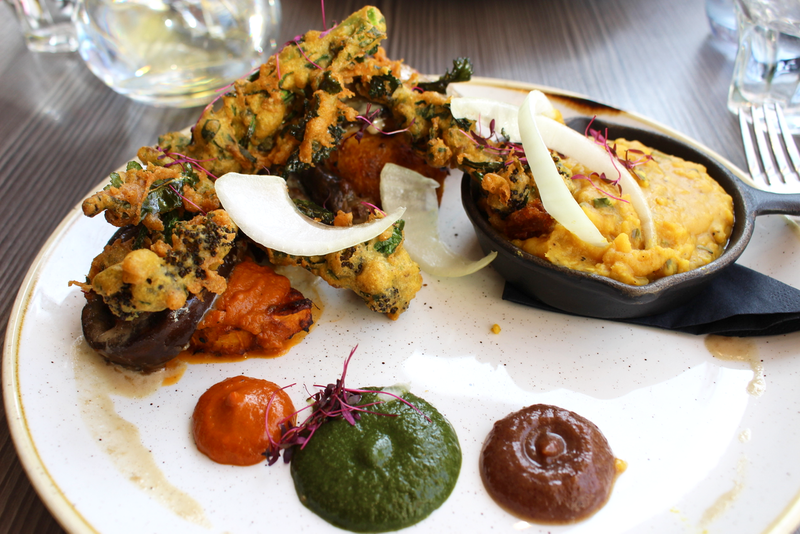 I ordered the Roast Coconut & Aubergine Curry with masala potato, yellow dhal, broccoli pakora and spiced pumpkin. The dish came with everything separate on the plate, as with a traditional curry, which not only looked beautiful but made each bite so exciting as I worked my way round. I was blown-away by every mouthful - the curry just tasted so vibrant, so fresh, so exquisite and all the flavours complimented each other to perfection. The yellow dhal and masala potato were my two favourites...I could eat them again and again. The only part of the meal I wasn't as keen on was the broccoli pakora as I wasn't keen too keen on the batter coating, but it still tasted good. 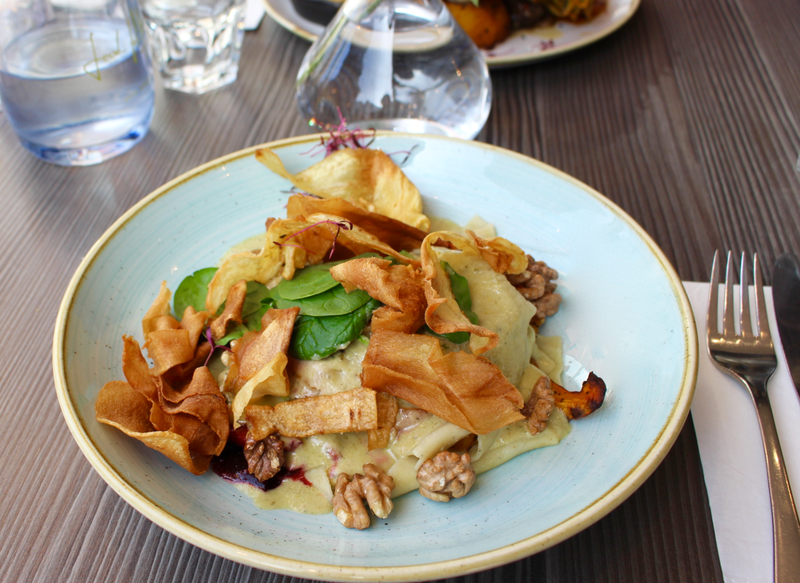 My boyfriend ordered the Homemade Open Ravioli in a Brighton blue cheese sauce with herb roasted beetroot, butternut squash and baby spinach, topped with parsnip crisps and walnuts. Unfortunately this dish contained both gluten and dairy so I was unable to try it, but my boyfriend gobbled it up and has since said on two or three occasions that he wants the 'Food For Friends ravioli' again! He described the sauce as rich and creamy that was paired really well with the butternut squash and spinach to add some real freshness to the dish. The only thing he'd change was the amount of parsnips crisps on top, they tasted good but there was a lot of them and he'd have rather had more of the ravioli instead. When it came to course 3 we were both stuffed. I had to loosen my belt and my boyfriend looked like he was about to go into a food-induced coma. The portion sizes are certainly generous at Food For Friends! But....I couldn't go to a restaurant and not review a dessert, could I? 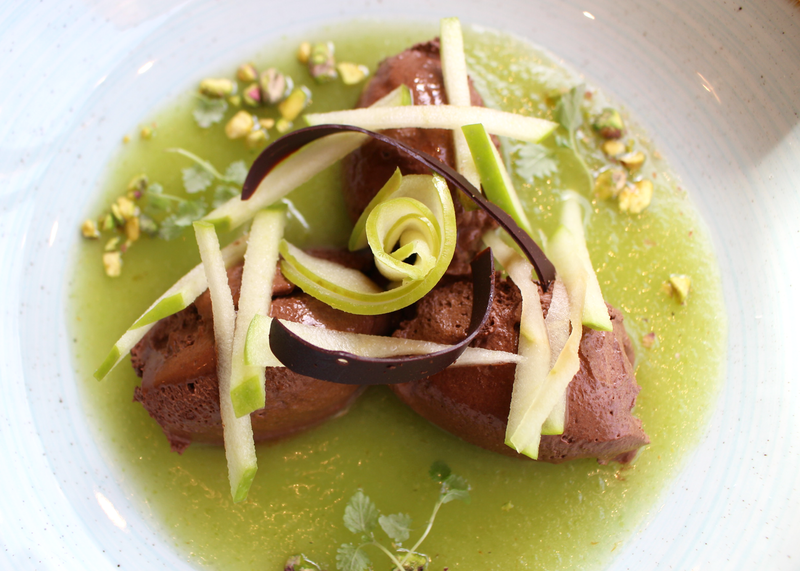 So I ordered the only gluten free, vegan choice which was a Dark Chocolate Mousse with apple gel, apple salsa and chocolate pistachio discs. I didn't quite know to expect and I'm not normally a huge fan of apple-flavoured things but I was highly impressed with this dessert! It was presented beautifully on the plate, the mousse was light, fluffy, creamy and rich with the perfect amount of sweetness and the apple gel surrounding the mousse complimented the dark chocolate really well as it was both sweet and slightly sour. I could only manage about four mouthfuls before I was fit to burst but I desperately wish I could have finished it! Overall I was highly impressed with all aspects of my Food For Friends experience. The food quality was undeniably incredible, the menu was varied, the atmosphere was great and the service was exceptional. 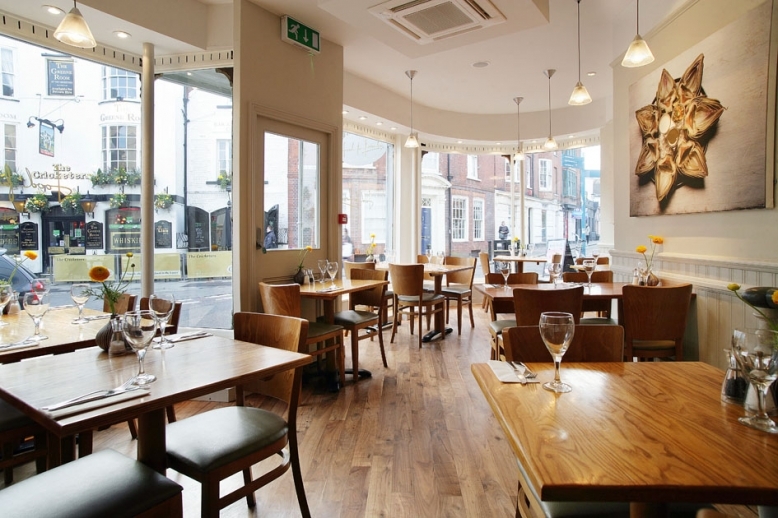 It's the perfect restaurant for a special dinner or if you fancy a little more special place to go for lunch before a wander around Brighton. If you're going for lunch Food For Friends have a special lunch menu with a range of truly delicious dishes including a sharing platter of dreams! Or, you could pop in for an 'adult afternoon tea' - a dessert and cocktail for just £10! I couldn't recommend Food For Friends enough - I can't wait for my next meal there!